Tammy aka Debbie Reynolds came to Branson this week and Mr. Bruce and I went to see her show. How wonderful and exciting is all of this. First, we went to Kansas City to see "Singing in the Rain" on the big screen. Click here to read about that fantastic time. Later in the week, we watched it again on TV. Quite by accident, I learned that Debbie was going to be at the Andy Williams Theater in Branson for 6 shows this week. Oh my gosh, I flipped out. Seeing her is person has been on my bucket list for years. I was on the phone early the next morning getting tickets. I don't know how many people the theater holds, but it was about half full. Almost everyone was in the over 60-age group and were excited about being there. Bob Anderson was the opening act. He is a great singer in his own voice, but he is best known as "the best singing impressionist of all times". Bob performed in Las Vegas for 30 years. He has done occasional shows in Branson for several years now. We have seen his show half a dozen times. I swear he does the best Frank Sinatra and Sammy Davis Jr. ever. After Bob Anderson's performance was a short intermission. 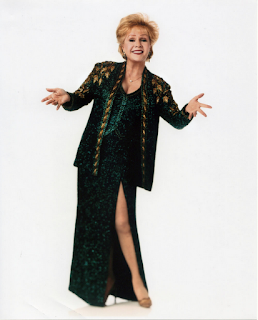 Then Debbie Reynolds entered the stage with the grace of a queen. She was accompanied by Joey Singer on the piano, a young man on the drums, and recorded music. She is very witty, made jokes with people on the front roll. She told old jokes and several referring to her age and her marriages. At first, she couldn't sing but the first lines of a song until her voice gave out. However, the further into the show she got, the better she sounded. My favorite part was about half way through the show. They ran short clips of scenes from a few movies, and she sang along a bit or told a bit about the movie. She and Judy Garland were very good friends. She sang 3 of Judy's songs as a tribute. Sang every word and hit every note. She closed the show with "Tammy". At first, it was a bit unnerving to be watching an 80-year-old woman on stage singing and joking around. Still I am so glad we went. The songs and her laughter took us on a trip down memory lane. Mr. Bruce and I were not old people for a couple of hours. In our minds, we were youngsters watching a delightful musical at the movies. We were young adults who played Debbie Reynolds records and singing along when her music was on the radio.